For the main campus, see Purdue University. 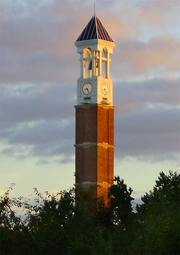 Purdue University is a public university system in the U.S. state of Indiana. A land-grant university with nearly 75,000 students across four traditional campuses, a statewide technology program, extension centers and continuing education programs, as well as another 30,000 students enrolled in an online university. Each university in the system maintains its own faculty and admissions policies which are overseen by the Purdue University Board of Trustees. Purdue's main campus in West Lafayette is the most well-known, noted for its engineering, agriculture, and business administration programs, which consistently rank among the best in the country and the world. Purdue University’s main and largest campus is located in West Lafayette, Indiana on the banks of the Wabash River. This main campus anchors the Purdue system statewide, which comprises regional campuses, satellite technology-training centers, and county agricultural extension offices. Purdue University formerly operated two regional campuses, Purdue Calumet in Hammond and Purdue North Central near Westville. In 2016 Purdue combined the curriculum for its two regional campuses and now houses it under one name: Purdue University Northwest (PNW). PNW runs two campuses in Northwest Indiana. The newest Purdue campus is Purdue University Fort Wayne (PFW) in Fort Wayne, which began operation on July 1, 2018 following the dissolution of Indiana University – Purdue University Fort Wayne (IPFW). The latter school had been a joint venture between the Purdue and Indiana University systems, under the budgetary administration of the Purdue system, but the systems agreed to split IPFW's academic programs among themselves, with all IPFW health sciences programs now part of Indiana University Fort Wayne and all other academic programs now operated under the auspices of PFW. Two joint IU–Purdue campuses remain in operation: IUPUI in Indianapolis, and IUPUC in Columbus. IUPUI is integrated into the IU system budget, but is otherwise semi-autonomous (including independent control of its own academic curricula) and degree-granting in over 175 programs. IU–PU Columbus is a regional campus, similar to PNW and PFW, but administered through IUPUI. In addition to its main location in West Lafayette, the Purdue Polytechnic Institute, one of the 10 academic colleges at Purdue University, operates nine satellite locations across Indiana. Degree programs at each location are regionally determined by current and projected workforce needs within the region. These are located in Anderson, Columbus, Indianapolis, Kokomo, Lafayette, New Albany, Richmond, Vincennes, and South Bend. These locations offer certificate, associate, and/or bachelor's degrees, some of which are ABET-accredited technical degrees. In conjunction with the state of Indiana, Purdue University operates one cooperative extension office in each of the 92 counties comprising Indiana. Each of these cooperative extension offices provides information and analysis for farmers, agricultural-industry employees, gardeners, naturalists, and homeowners. Cooperative Extension also includes youth development, family and consumer sciences, and community development. Purdue University Global, (PG), is an adult-serving public university, operated as part of the Purdue system, primarily online. As with other campuses in the system, PG has its own faculty, admissions policies and curriculum but is overseen ultimately by the Purdue University Board of Trustees. Purdue Global offers certificates, and degrees at the associate’s, bachelor’s, master’s, and doctoral level. Diplomas given by Purdue Global differ from other schools in the Purdue system, and have a different name, font, and bear the PG logo in place of the Seal of the Purdue University Board of Trustees. The state of Indiana received a gift of $150,000 from John Purdue, a Lafayette business leader and philanthropist, along with $50,000 from Tippecanoe County, Indiana, and 150 acres (0.6 km²) of land from Lafayette residents in support of the project. In 1869, it was decided that the college would be founded near the city of Lafayette and established as Purdue University, in the name of the institution’s principal benefactor. Classes first began at the Purdue main campus on September 16, 1874. Purdue issued its first degree, a Bachelor of Science in Chemistry, in 1875. Architecturally, Purdue University buildings at the West Lafayette campus generally feature red brick. After the return of a large number of veterans at the close of World War II, Purdue University opened over forty extension centers throughout Indiana. Through these many extension centers Purdue University offered freshman-level classes for both the purpose of the convenience of students starting their college studies close to their residence before taking the more major step of transferring to the main campus in West Lafayette, Indiana as well as the purpose of off-loading a substantial number of freshmen from scarce residential and classroom resources of which the main campus was in short supply to handle a rapid major expansion in its enrollment following the periods of smaller enrollment during both the Great Depression and World War II. Of these over forty extension centers, five were retained over the multiple decades since WWII and transformed into institutions that grant degrees that require four or more years of study. Of these five, three of them—PFW, IUPUI, and Purdue Calumet (now part of Purdue Northwest)—are medium-sized residential, research universities that each grant 100 to 200 different degrees, majors, or programs across a wide diversity of areas of study. In fact, with enrollment approaching 30,000 students, IUPUI is more properly categorized as a large university in its own right that grants doctorate degrees as well as master’s, bachelor’s, and associate degrees, but at IUPUI the number of Indiana University programs and students is significantly larger than the number of Purdue University programs and students. Following the lead of Indiana University's downtown Fort Wayne, Indiana extension center that was established in 1917, Purdue University founded the Purdue Fort Wayne Extension Center downtown in the fall of 1941 to provide a site in Fort Wayne for students to begin their undergraduate studies prior to transferring to the West Lafayette main campus to complete their degree. Under the direction of Purdue University president Frederick Hovde, Indiana University President Herman Wells, IU trustee John Hastings, and Purdue Trustee Alfred Kettler, Sr, the Indiana University and Purdue University extension centers began merging in 1958. To serve the extension centers' now combined mission in Fort Wayne, Fort Wayne's Indiana-Purdue Foundation purchased 216 acres (0.87 km2) of farmland at the then-suburban northern edge of Fort Wayne. The new Indiana University—Purdue University Fort Wayne (IPFW) campus opened on September 17, 1964 following nearly two years of construction that began on October 18, 1962. At the time of its dissolution in 2018, IPFW was a 520-acre (2.1 km2) campus on both sides of the Saint Joseph River with 13 educational buildings, plus student residences and various other athletic facilities and parking structures. IPFW awarded its first four-year degree in 1968 after awarding two-year degrees through the IU Fort Wayne extension center prior to the formation of the joint IPFW campus. The joint campus was administered through Purdue University, although the medical programs and the library were administered through Indiana University. IPFW's degrees were awarded by either Purdue University or Indiana University on a program-by-program basis. IPFW's curriculum contained over 170 degrees, majors, or programs. Architecturally, IPFW buildings generally feature brown or tan brick as a variation on Purdue's main campus' red brick. In December 2016, the governing boards of the IU and Purdue systems initially approved a plan to split IPFW into two separate institutions. Both boards gave their final approval to the split in June 2017. Effective July 1, 2018, IPFW's academic programs in health sciences were taken over by IU under the identity of Indiana University Fort Wayne (IUFW). All remaining academic programs moved to the Purdue system under the banner of Purdue University Fort Wayne (PFW). PFW continues to provide administrative services and general education classes for IUFW students. IPFW's athletic program completely transferred to Purdue Fort Wayne, and shortly before the split took effect, the athletic program renamed itself from Fort Wayne Mastodons to Purdue Fort Wayne Mastodons. Following the model of the downtown Indianapolis permanent extension center established by Indiana University in 1916, Purdue University founded the Purdue Indianapolis Extension Center downtown in the fall of 1946 to provide a site in Indianapolis for students to begin their undergraduate studies prior to transferring to the West Lafayette main campus to complete their degree. The Indiana University School of Medicine was established at Indianapolis in phases between 1911 and 1919. In 1944, Indiana University acquired the Indiana Law School, which is now the Indiana University Robert H. McKinney School of Law. In 1969, the Purdue University Indianapolis Extension Center merged into the Indiana University Indianapolis campus to form IUPUI. IUPUI awarded its first four-year undergraduate degree in 1970, having previously awarded graduate degrees in law and medicine for decades through the Indiana University Indianapolis campus. In 1974 Indiana University was reorganized to make the Bloomington and Indianapolis campuses the two core campuses of the Indiana University system. IUPUI is administered through Indiana University. IUPUI's Purdue University programs are in two schools that are academically affiliated with Purdue University. IUPUI's degrees are awarded by either Purdue University or Indiana University on a program-by-program basis. IUPUI's curriculum contains over 350 degrees, majors, or programs. Architecturally, IUPUI buildings generally feature Indiana limestone, as IU Bloomington buildings do as well. IUPUI is located on a 285-acre (1.15 km2) campus west of downtown Indianapolis. The Purdue University programs at the Purdue Indianapolis Extension Center awarded their first two-year degrees in 1947. Indiana University first opened their extension center in Columbus, Indiana in the fall of 1941. Purdue University first opened their extension center in Columbus in the fall of 1942. IUPUI Columbus began operations on August 17, 1970 as an extension of IUPUI. The building which currently houses IUPUC was first occupied by IUPUI Columbus in 1974. The name of IUPUI Columbus was changed to IUPUC in 1994. IUPUC is administered through IUPUI. IUPUC's degrees are awarded by either Purdue University or Indiana University on a program-by-program basis. Because IUPUC grants only one master's degree, 15 bachelor's degrees, and 6 associate degrees, IUPUC is still in the early part of the transformation from feeder-campus status (where students are expected to transfer to the main campuses of IUPUI, Purdue University, or Indiana University Bloomington for completion of their degree) to full university status (where students can pursue at the same campus any one of a wide diversity of degrees, majors, or programs offered by any of multiple colleges or schools based at that campus). Purdue University Northwest was established in 2016 via the merger of two former Purdue regional campuses—Purdue University Calumet in Hammond and Purdue University North Central in Westville. Both predecessor institutions opened in 1946. Calumet opened as a regional extension, with classes at various locations in the area. All Calumet operations were centralized at a new 50-acre (20 ha) campus in Hammond in 1951. The campus has remained at this location, but has since expanded to 194 acres (79 ha). In 1962, the Purdue system redefined Calumet as a full regional campus, and as a regional university in 1979. After years of offering only associate's degrees, it awarded its first bachelor's degrees in spring 1967. Calumet became a residential campus with the 2005 opening of its first residence halls. North Central was also established as a regional extension, initially offering classes in LaPorte and Michigan City. All classes were centralized in 1949, and the university purchased a 160-acre (65 ha) site in 1962 to begin the process of converting what was then known as the Barker Memorial Center to a full regional campus. The new campus opened in 1967, and has since been expanded to 305 acres (123 ha). Three campuses of the Purdue University system sponsor NCAA Division I teams. The Purdue Boilermakers, representing the West Lafayette main campus, field 18 teams, including the system's only football team. The Boilermakers are members of the Big Ten Conference in the Football Bowl Subdivision. The Purdue Fort Wayne Mastodons field 16 teams, mostly in the Summit League. Finally, the IUPUI Jaguars field 14 teams as members of the Horizon League. Purdue University is managed by a ten-member board of trustees who are appointed by the governor of Indiana. Three of these trustees are Purdue graduates nominated by the alumni association, while another must be a current full-time student. The university president is the chief executive officer of Purdue. Each campus—with the exceptions of West Lafayette and IUPUC—also has a chancellor. The powers of a chancellor at the West Lafayette campus are exercised by the president. IUPUC's leader has the title of vice-chancellor and serves under the chancellor of IUPUI. ^ "System-wide Faculty and Staff Headcount " Archived May 19, 2011, at the Wayback Machine. 2010–11 Purdue University Data Digest. p. 156. Retrieved June 9, 2011. ^ a b c "System-wide Enrollment by Student Level" Archived May 19, 2011, at the Wayback Machine. 2010–11 Purdue University Data Digest. p. 150. Retrieved June 9, 2011. ^ "Land and Facilities" Archived May 19, 2011, at the Wayback Machine. 2010–11 Purdue University Data Digest. p. 85. Retrieved June 9, 2011. ^ Driver, Saige (December 1, 2016). "IU Board of Trustees approves IPFW realignment into 2 schools". Fort Wayne, IN: WOWO. Retrieved January 22, 2018. ^ Driver, Saige (December 16, 2016). "Purdue Board of Trustees approves IPFW split". Fort Wayne, IN: WOWO. Retrieved January 22, 2018. ^ a b Wright, Darrin (June 16, 2017). "Indiana, Purdue trustees officially finalize IPFW split". Fort Wayne, IN: WOWO. Retrieved January 22, 2018. ^ "About the Transition". Indiana University Fort Wayne. Retrieved July 18, 2018.